Can't attend? 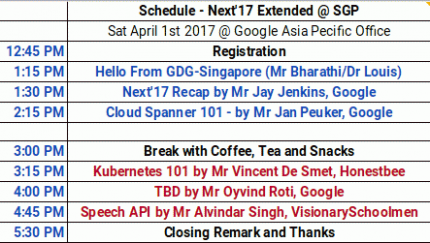 Follow GDG-Singapore to know of future events! Next ‘17 will be the largest event in Google’s history. Google Cloud engineers, customers and partners will gather for inspiration and hands on experiences with tools, technologies and services born in the Cloud, including the latest developments from Google Cloud Platform, G Suite, Maps and Devices. You don’t have to be in San Francisco to be part of history! 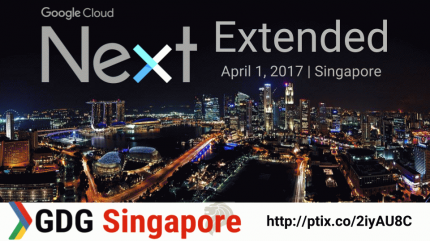 Join us for NEXT Extended event at Google Asia Pacific Office in Singapore! Learn what's new with Google Cloud Platform, try few hands-on codelab on your laptop and interact with experts and developers just like yourself.